If you would love books that introduce your tweens (perhaps) and teens to all the drama, the tragedy, the over-the-top excesses that are the Greek Legends, let me introduce you to George O’Connor. O’Connor is an author/illustrator who has created a series called Olympians, published by First Second (Macmillan). 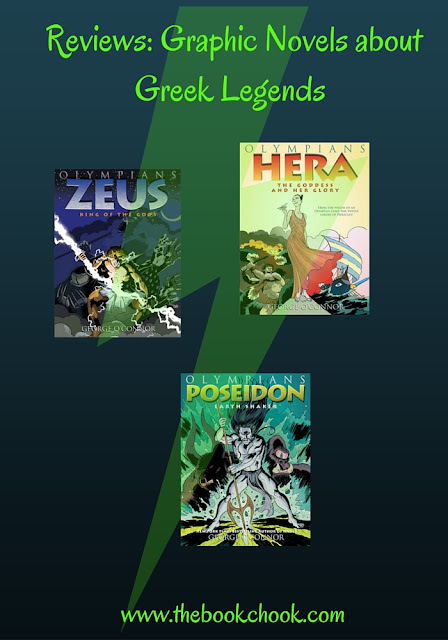 Currently at eight volumes, the series consists of Zeus, Athena, Hera, Hades, Poseidon, Aphrodite, Ares, and Apollo. Artemis is due out in 2017. Zeus: King of the Gods (Olympians Volume 1) is a great introduction to Greek legends because it starts at the start: out of Kaos comes Gaea, and then Gaea makes Ouranos. Eventually Kronos kills Ouranos, and then proceeds to swallow all his children, except for Zeus. Volume 1 of OLYMPIANS, ZEUS: King OF THE GODS, introduces readers to the ruler of the Olympian Pantheon, telling his story from his boyhood to his ascendance to supreme power. In the fifth installment of the Olympians series of graphic novels, author/artist George O'Connor turns the spotlight on that most mysterious and misunderstood of the Greek gods, Poseidon: Earth Shaker. Thrill to such famous myths as Theseus and the Minotaur, Odysseus and Polyphemos, and the founding of Athens—and learn how the tempestuous Poseidon became the King of the Seas. O’Connor has the clever knack of sticking to the “facts” of these Greek tales, but also bringing them to life for us. The art work in particular will appeal to kids - sometimes dark and mysterious, often violent and from a perspective that enhances the power and brutality of the characters. Some panels are full sized, others are smaller, focussed on a detail perhaps - so much variety and drama that kids will certainly want to read and re-read. Lots of comic book elements are used in this graphic novel - there are plenty of the exclamations and noises in speech bubbles, as well as the art work so often found in superhero tales, to make kids feel comfortably that this is like a comic. But there’s quite a lot of reading as well, and these books will make a great introduction to more research and reading of the Greek legends in other media. I really like the way O’Connor reveals the Olympians characters through their thoughts and dialogue as well as their actions. Here is Poseidon, declaiming his powers: “I am Poseidon, earth shaker, ruler of the boundless sea, creator of storms, swallower of ships”. Often, the formality of the language used underscores that readers are learning about something momentous that happened long ago. Here is a caption just after Odysseus has blinded Polyphemos: “But for all his cunning, this Odysseus was a foolish and prideful man.” There are great touches of humour too like when Hera finds her husband, Zeus having a romantic picnic with a cow. Zeus blurts out that the cow is a gift for her, so Hera leads him to implicate himself more deeply, looking coy and exclaiming” Whatever made you think to get me such a romantic gift?” The shenanigans the gods get up to are handled carefully by O'Connor, with all scenes I read suitable in my opinion for kids 11/12+. However, it's always best to make your own decision before introducing books to students/your own children. Not just a great introduction to Greek legends, but also a wonderful way to lure reluctant readers away from the dark side, I believe these graphic novels would be an asset to any home or library.